The Bookmark. 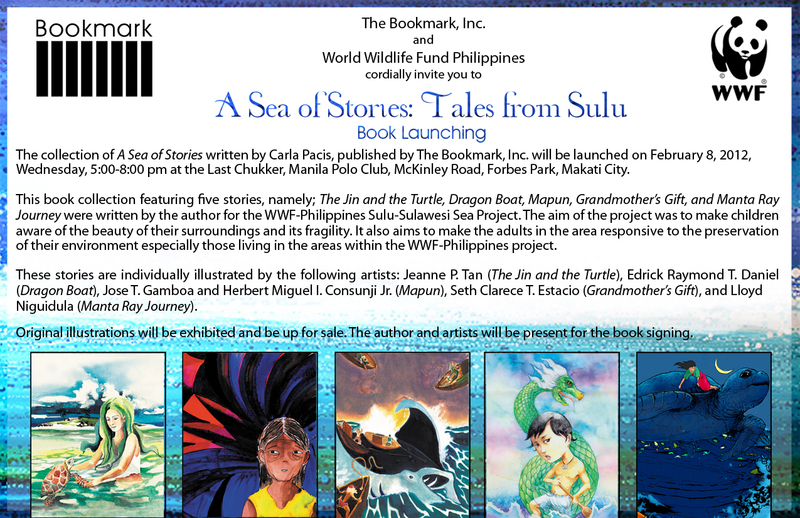 Inc. and WWF Philippines are launching a series of children’s books entitled ‘Sea of Stories: Tales from Sulu’. These stories were written by Carla Pacis and individually illustrated by various artists. JB Gamboa and I have illustrated and designed the book Mapun. Other books in the series are: The Jin and the Turtle, Dragon Boat, Grandmother’s Gift and Manta Ray Journey. The illustrations are by Jeanne Tan, Edrick Daniel, Seth Estacio and Lloyd Niguidula respectively. Sea of Stories were written by Carla Pacis for the WWF Philippines Sulu-Sulawesi Sea Project. The aim was to promote awareness in the preservation and protection of the environment. The book launch is on February 8, 5-9 PM at the Manila Polo Club.